Summer is here, friends! Yesterday marked Wild Man’s last day of kindergarten and we now officially have a first grader! We got a great packet of summer activities from his teacher, but the number one thing she wants him to do is practice reading. Wild Man’s reading has really taken off in the last few months and today we are sharing five of his favorites. These are also some of Bunny’s favorite books, so kids of all ages should enjoy them. Wild Man’s favorite thing to do lately is to read to Bunny, which is super sweet and helps them both get their reading time in. Hopefully, your kids will enjoy reading these as much as ours do. “The Day the Crayons Quit” explores what happens when Duncan discovers that his crayons have quit. Throughout the book, all the colors chime in with their grievances and inter-crayon disagreements. This book never fails to crack up our kids – the idea that crayons can get mad at you is hysterical to them. This book is a favorite read for kids and adults alike. “The Day the Crayons Come Home” is the sequel to our first pick and is just as much of a favorite in our house. The kids often ask to read them one after another. It turns out that Duncan’s crayons miss him and don’t want to quit after all. This book shares their adventures as they try to get home and the compromises they make to all get along. It’s just as hysterical as the first book and is great for early readers. “The Adventures of Beekle: The Unimaginary Friend” is a beautiful tale of an imaginary friend who longs for his person. Beekle journeys over the ocean and to the real world searching for his friend and finally finds Alice. The two go on grand adventures together and explore the differences between the imaginary and “real” worlds. The illustrations are absolutely beautiful and it is a quick read with a deeper meaning. “Iggy Peck, Architect” is a fun romp of a book. Iggy is a delightfully ingenious boy who loves to build and create fantastic things. The book inspires children to stretch their imaginations and our two kiddos often can be found building giant Duplo towers after reading. Wild Man has long loved planning Duplo/Lego creations and he was delighted to discover that was a career. He has even snuck this one in bed and loves reading it during quiet time. “Harry the Dirty Dog” was one of my all-time favorite books as a child and I’m thrilled that the kids love it as much as I did. The classic book follows Harry as he runs away from home, getting as dirty as possible along the way. Eventually, he decides he misses his people and goes home. Sadly, he’s gotten so dirty that his family doesn’t recognize him! Bunny is always so sad that they don’t know who Harry is and Wild Man quickly jumps in to reassure her that all will be well in the end. This book surely stands the test of time and is a great practice book for early readers – the sentence structures are simple and the story is entertaining. So those are five of our favorite books for reading this summer. Want even more options? 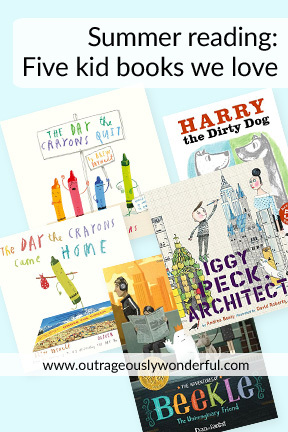 Check out our Sunday Share: Books we love, kindergarten books edition. Interested in some suggestions for yourself? Check out what I’m reading.